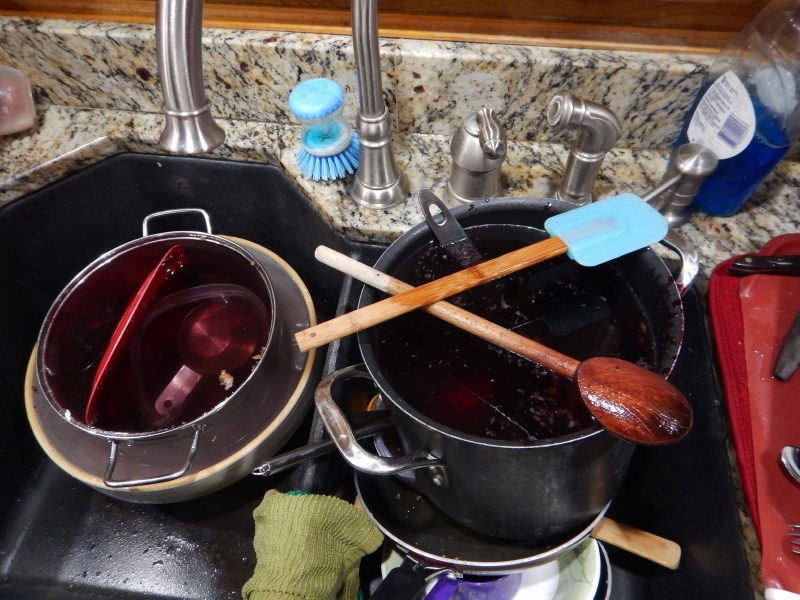 Cyndie cooked up some star-spangled black cap jam yesterday! 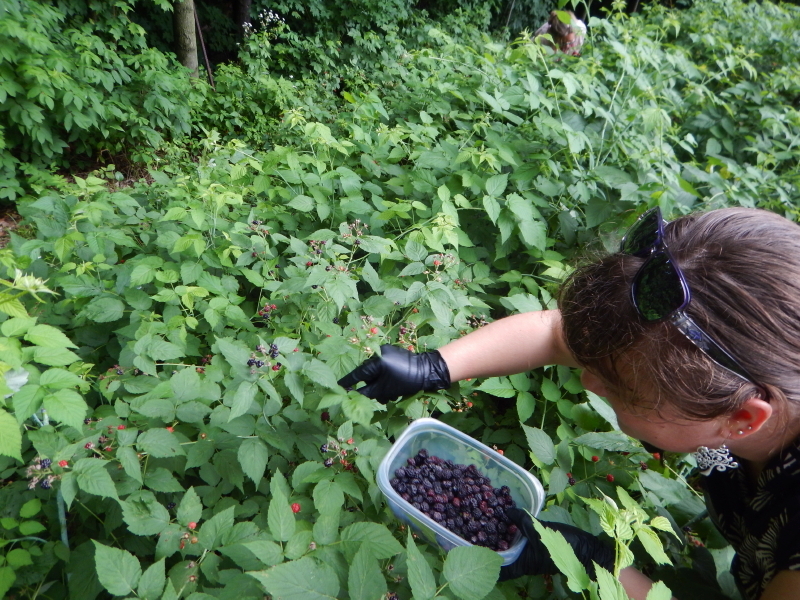 It all started with some pre-canning berry picking when Elysa and Ande arrived to join in the fun. Made from real fresh berries. 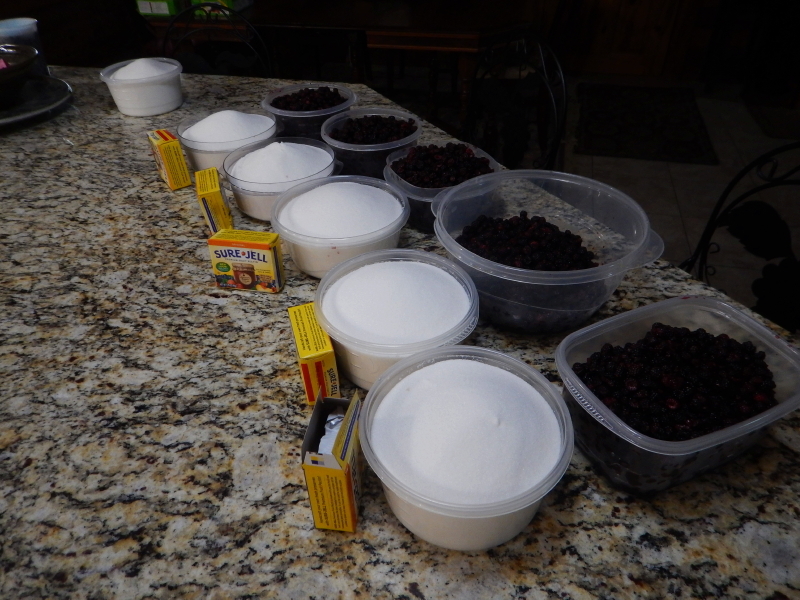 Then the cooking magic in the kitchen commenced, using more sugar than I am allowed to be in the same room with, leading to jars upon jars of the precious dark jam. And a filled kitchen sink. Just to top off the busy afternoon over the stove, Cyndie baked two loaves of bread so we could test out the jam while it was still warm. The flavor treat set off fireworks in my taste buds! Speaking of fireworks, one of my trusted news sources (who shall go unnamed to protect their reputation) let me down royally with a timely story offering four tips to help dog owners ease the stress of frightened pets during the sunset hours of exploding ordinance this time of year. One: Don’t take your pet to the fireworks show. Two: Keep your pet safe at home. Isn’t that the same thing as not taking them to the show? Three: Try over the counter remedies. Oh, why didn’t I think of that before? Four: Make sure your pet is microchipped. July 4 is the number one day dogs and cats get lost, it says. Well, that is not a tip that will ease my dog’s stress, so that was only three morsels of expert advice. Color me thoroughly disappointed in that “helpful” tidbit of intrepid journalistic expertise. We ushered Delilah into her “den” for the night, and she was able to quietly ignore the repeating echoes of small arms fire sounds percolating well past my bedtime. Delilah sleeps in a crate with a cover draped over it, which seems to provide her with enough comfort that she will generally ignore most activity overnight. Last night, I could have used a sound proof cover over my bed. Regardless, once I got to sleep, it was dreamy visions of star-spangled black cap jam dancing in my head all night long. 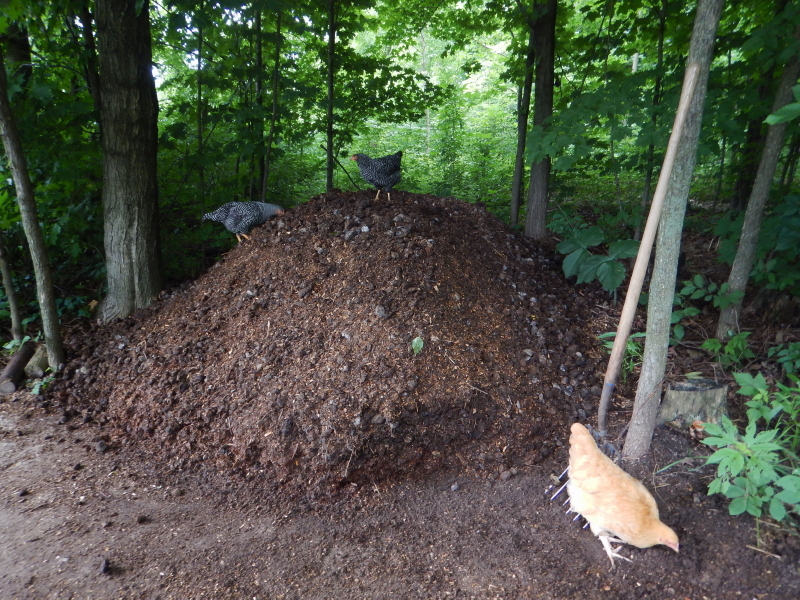 With John and Cyndie still up north, the chickens will take their turn at guest-blogging for a day. Hold your applause until you’ve actually read their scratching. Barred.1: Is this thing on? Buff: We are typing this out silly, not clucking. Barred.2: Oh. Never mind. Thought I saw the dog. Barred.1: Please don’t keep doing that. You trigger memories of the massacre. Buff: Do John’s blog readers know about six/sixteen? Oh how we miss our lost sisters. Buff: But we still have each other. Barred.2: And we have our safe tree over John’s compost piles, despite their efforts to convince us otherwise. Barred.1: Why won’t they let us roost there over night? It saved me back on six/sixteen! Buff: I think they are afraid that snazzy coop John built might go to waste if we don’t sleep in it overnight. Barred.2: Seems like as soon as you convinced me to join you in that tree they started knocking us out of it with brooms. Buff: I heard John and Cyndie talking about getting more chickens. I’m not sure what I think about that. She raised us since we were a day old. How do we just accept a flock of strangers into our space? Barred.1: But maybe they will know how to lay eggs. Then maybe Cyndie would take out those neon plastic ones from the nest boxes that she thought would help us figure it out. Barred.2: Eggs! Do we have to? I thought we were just supposed to eat bugs. Lord knows, they have enough of them. Buff: OMG. I can’t eat enough to give those horses a break. The biting flies were harassing them something awful the other day. Legacy almost squished me when he was stomping to shake them loose. Barred.2: Well, Cyndie has been trying to coax us to the coop at dusk with so many raspberries, I worry about my figure if eat insects all day too. Barred.1: [squawk!] Hah! I know! But she’s so cute with her sweet little-girl cooing voice, I can’t resist. Buff: Were we supposed to be writing something for the blog? Barred.2: Some relative thing John does in his spare time, I think. Buff: They are supposed to be home tonight. We can ask him then. Barred.2: Can you wait until Cyndie serves up bedtime treats before you ask? Barred.1: You’re such a chicken. Barred.2: Takes one to know one. 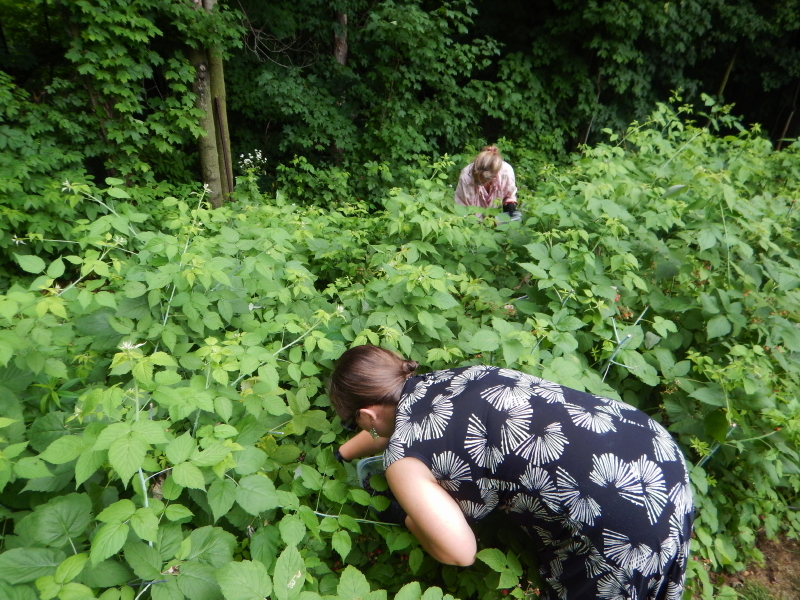 When the fruit matures on all the wild raspberry bushes around our property, you can’t pick fast enough to keep up with the supply. It becomes a full-time job for about a week or so. Too bad neither of us are able to give it that kind of attention. Cyndie does a more than adequate job to collect a reasonable amount. 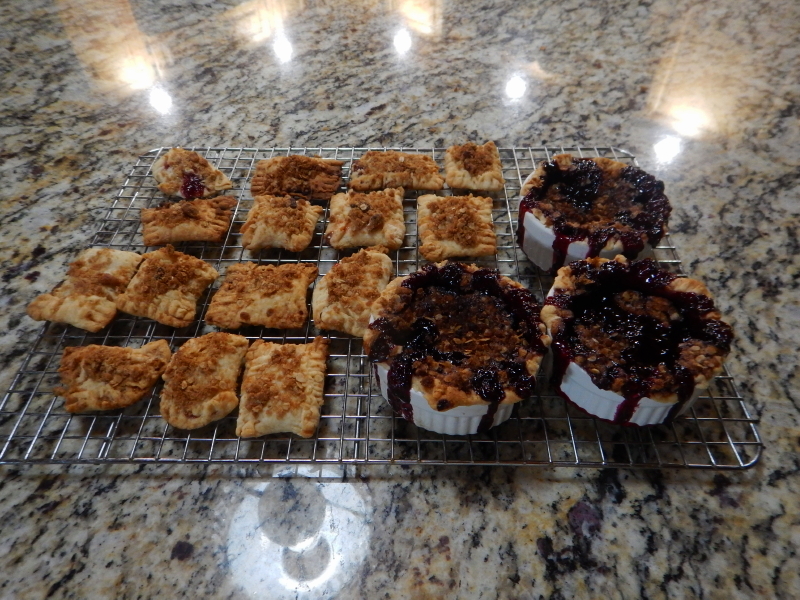 Last night the berries were turned into a few miniature pies and a batch of homemade pop-tarts. I’m going to be picking tiny seeds from my teeth on a regular basis for a week or two based on her ambitious efforts to put the berries to good use. One of my strong favorites is spreading her black-cap jam over cream cheese spread on a good piece of heavy grain toasted bread. It’s a taste and texture extravaganza! Today is Independence Day in the U.S. I’m not sure whether there is added significance about the holiday this year, but it feels more complicated than usual with the turmoil over the bizarre turn our national government has taken, starting early in the Presidential campaign season, then through the change of administration and beyond, and all the while, compounded by the apparent ongoing meddling of foreign nations. Did someone say “Russia?” Cough, cough. Regardless, we will be celebrating the day by mowing grass, composting manure, and picking raspberries. We returned from the lake yesterday afternoon, despite the gorgeous conditions beckoning us to stay. There was just too much work to be done at home. Unfortunately, more than gets done in one day, but what a difference a day can make. I’m confident I will feel just fine by the time I throw in the towel tonight and head in for a shower and some dinner. 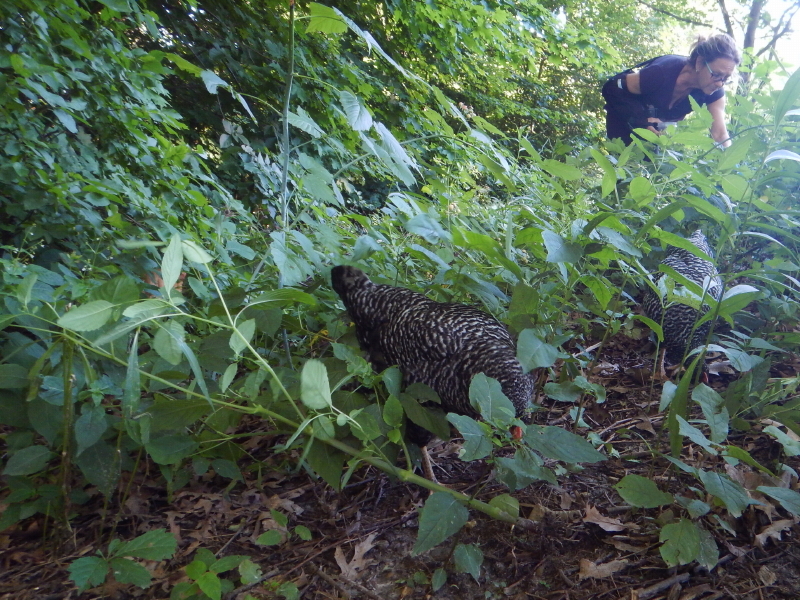 We took a little reconnaissance walk around the property last evening and found horses and chickens in good order. Most noteworthy was the amount of progress visible in the raspberry bushes compared to how they looked when we left on Friday. 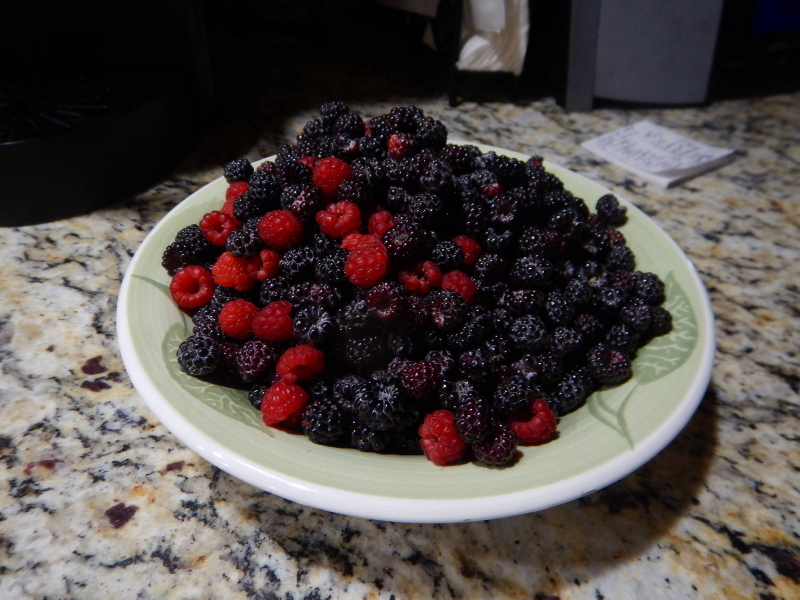 Without delay, Cyndie got a bowl and started collecting berries. Soon, the chickens arrived to join her. It appears she will have some added competition this year on picking raspberries. Another new addition to our landscape is bursting open like 4th of July fireworks! 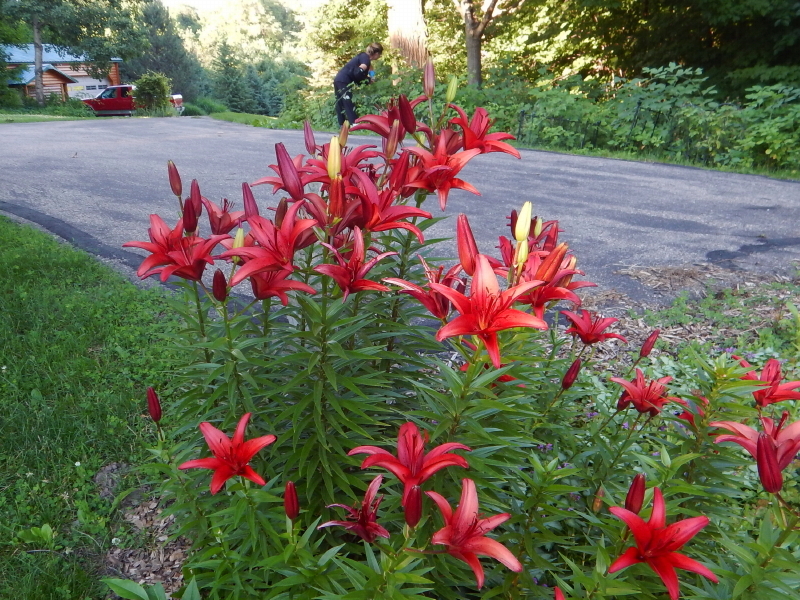 The first of the many colors of lilies at the top of our driveway are in full bloom. It was a nice treat welcoming us home. 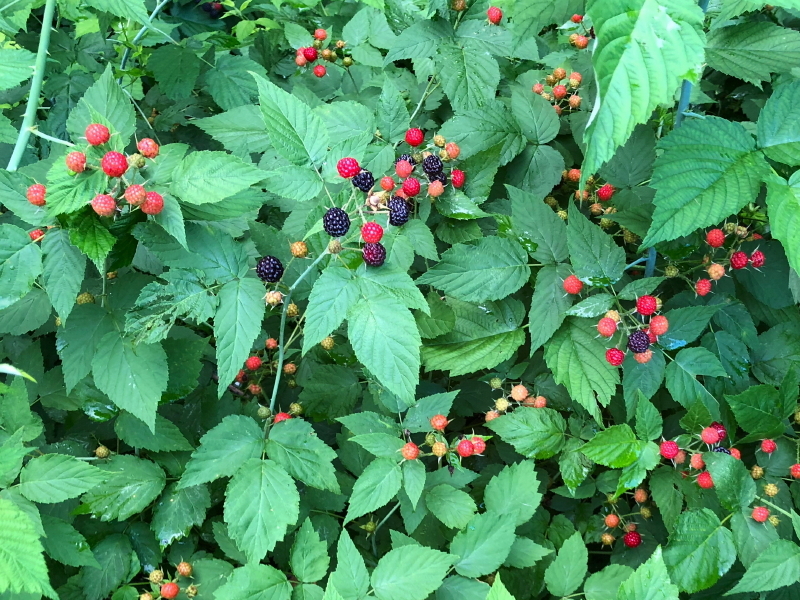 A number of our close advisors have provided insights on what we could do to tame the many wild raspberry patches that thrive on our land. Last weekend we finally made a first pass through the bramble that exists across the driveway from the house. In the four previous years since we moved here, we have simply harvested berries from wherever they appear. Some years the bounty was greater than we could keep up with and other years it has seemed a bit off. The hot spots tended to travel from one zone to another in any given season. Navigating the tangle of thorns to reach fruit in the center of the patches was often difficult and hazardous. 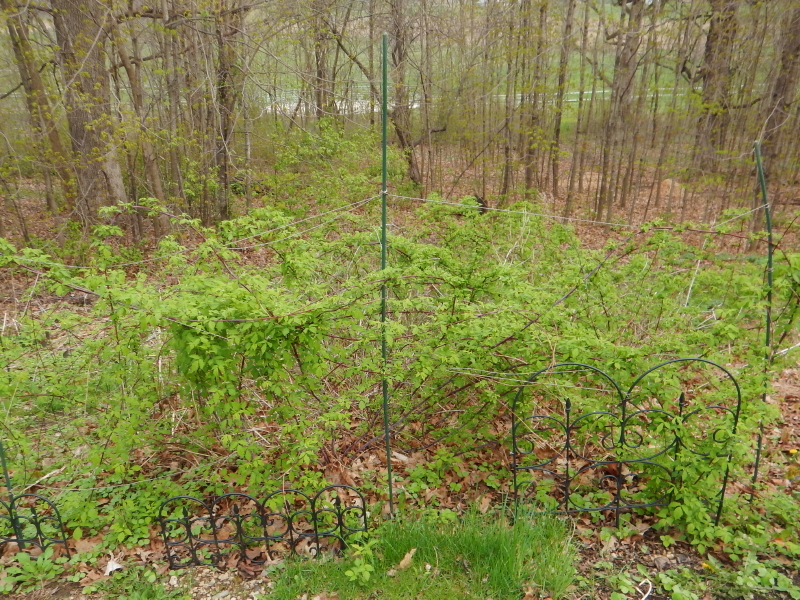 Since we never planted any of these wild raspberry bushes to start with, it doesn’t feel like we are risking too much to take a crack at cutting them back in hopes of encouraging some more orderly growth. There’s no reason to think new patches wouldn’t just sprout up again if we accidentally destroy a current one. That’s the way they got here in the first place, thanks to the birds and nature’s way of doing things. It seems realistic to me to expect that the trimming we have done may interfere a bit with the potential volume of this summer’s berry crop. Long term though, we think we will be cultivating better conditions for the plants. The ultimate result we are hoping for is improved berry production and a more enjoyable process of picking them. The season of spring is springing along nicely at Wintervale. 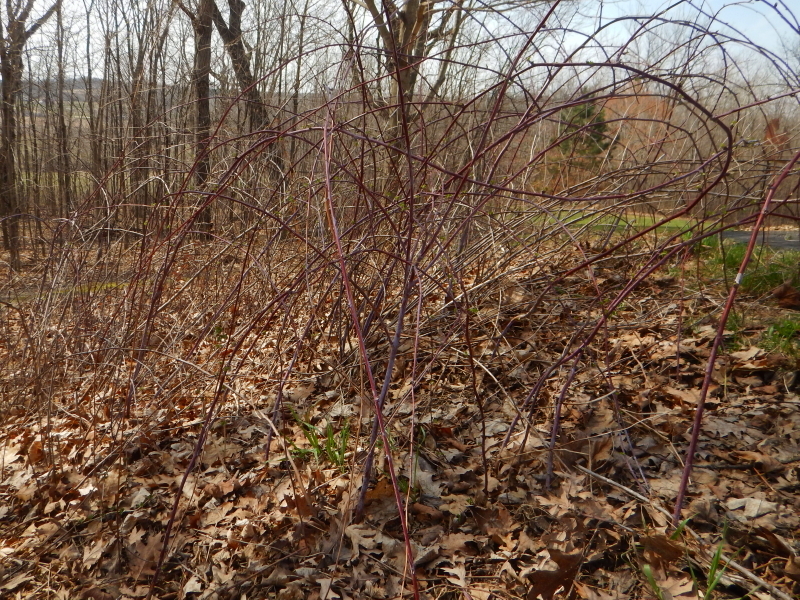 The leaves have started making an appearance on a variety of shrubs and saplings. 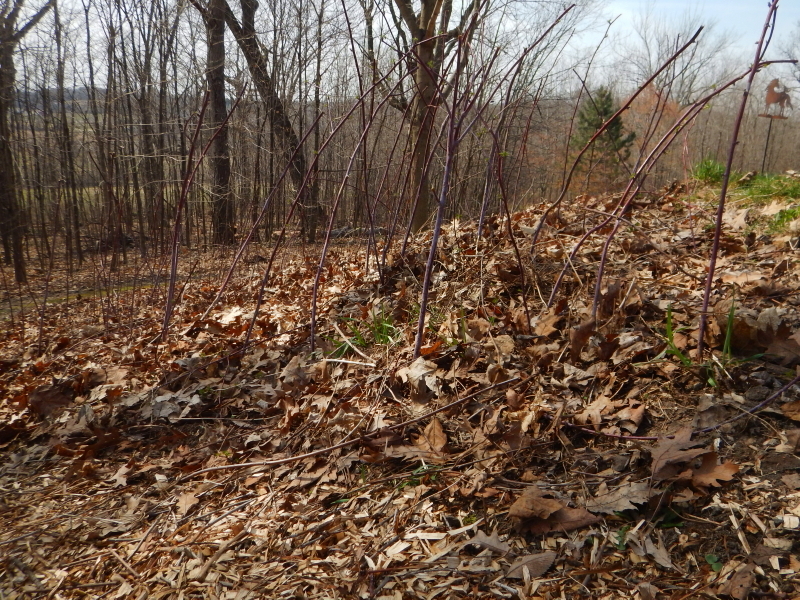 The raspberry bushes in particular have shown dramatic development in the last few days. It is hard to tell whether the recent rains triggered this, or it was just coincidental timing, and would have happened at this time, anyway. 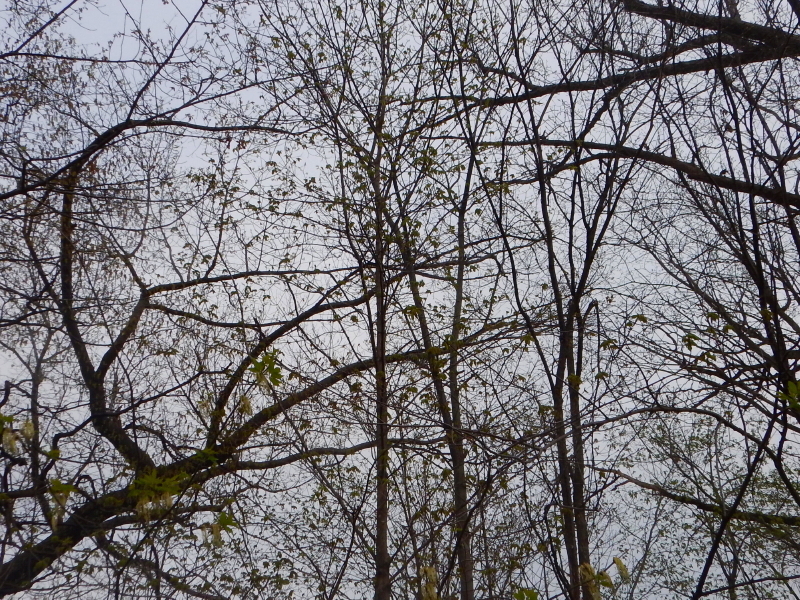 It amazes me how quickly the initial sprouts of foliage obscure the view into our woods. Very soon, there will be so many green leaves, we won’t be able to see more than the outer surfaces. I’m wishing I could remember this moment long-term in order to hold it as a reference for comparison with the other extremes of the stark bare branches of winter and the view-obscuring green leaves of summer. Every season seems to last just long enough that I mentally fall into a trap of perceiving views as if a present state is the only way it could ever be. When the forest is fully leafed out, I find it hard to comprehend that just months earlier, it was the complete opposite. Though most areas of our yard have yet to be mowed, I already needed to cut one section a second time. I sense that summer is just a short blink away from replacing spring, and the expanding leaves on trees and bushes will be leading the charge in the days ahead.